There are many things you could drink for Valentine’s Day, depending on the nature of your relationship: a snazzy cocktail at a dark bar (hot date), a cold Bud in front of the TV (married for 40 years), milk (you’re 8 years old and live with your parents). But in terms of romantic reliability, rosé Champagne or sparkling wine always wins. In fact, even for non-Valentine’s drinking, the category is booming. Over the past 10 years, it’s gone from about 7 percent to 16.2 percent of the Champagne sold in the US; rosé sparkling wines have grown similarly. The short version is that pink fizz is in. Here are five excellent suggestions for Valentine’s—or any other day, really. Raventós i Blanc left Spain’s Cava D.O. a few years back and now produces their wines under the “Conca del Riu Anoia” designation. In essence, their wines are made as Cavas are from the same grape varieties but with much more restrictions to ensure quality (lower yields, organic farming, estate fruit, etc). That pays off in this wine’s nuanced layers—smokiness, red berries, floral notes, citrus. One of a new wave of higher-end wines from the Prosecco region, this finely textured rosé sparkler has impressive elegance and minerality. Technically it isn’t an actual Prosecco, as the blend includes Pinot Noir, but given the quality, who cares? New Mexico’s Gruet Winery is known for very good, inexpensive sparkling wines (its basic rosé is a bargain at $16 or so). This vintage bottling is one of their top-tier selections; boldly flavorful, it shows ripe cherry flavors and a chalky/earthy finish. A small estate producer from the up-and-coming Côte des Bar region of Champagne, Moutard started making wine under its own name in 1920. This rosé is full-bodied in style, with substantial strawberry-inflected fruit. Popping the question? Just feel like spending a whole lot of money on a really great wine? 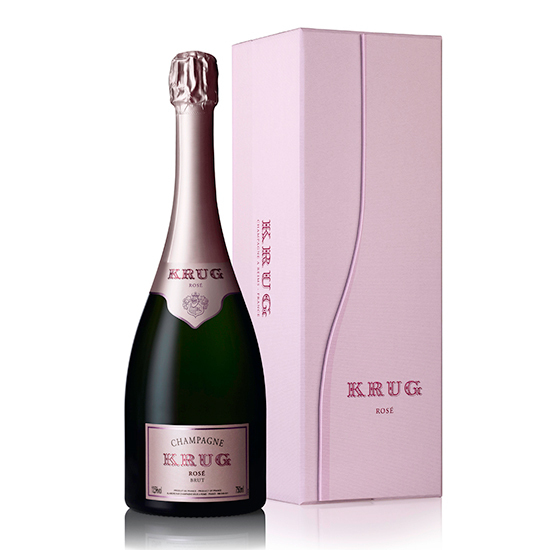 Krug’s rosé Champagne is pricey, to be sure, but it’s also remarkable: Delicate and complex on the nose, it reveals surprising power and richness when you sip it (ideally out of a white wine glass—great Champagne loses some of its complexity in a flute).